As you all know, I live in a City called Preston, which is in the North West, not far from more well known places such as Blackpool and Manchester. Preston is home to its own museum, The Harris Museum & Art Gallery, which is where my course held our fashion show at Christmas last year. This weekend, The Harris are holding numerous workshops in various subject areas within the art and design field. If you’re a prospective student of the University here, or are starting in September, this would be a great opportunity to get to know Preston and what it has to offer, especially if you’re embarking on an art related degree! Or maybe you’re just interested in the subject, or want to learn new skills from those in the know? Either way, be sure to make your way down to The Harris Museum this Saturday to take part in one of the workshops. 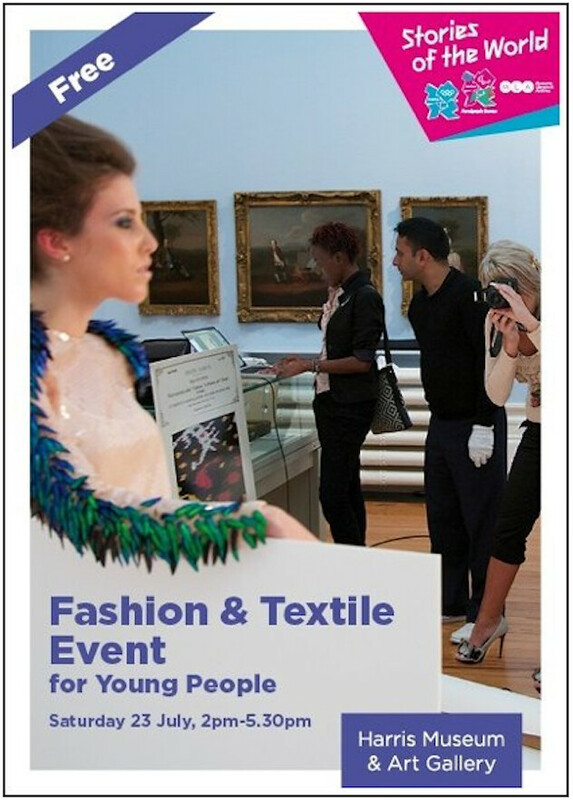 The event is in conjunction with a current exhibition being held at The Harris, called Global Threads. You can find out more about that and the workshops here. Fashion Photography and Styling.Led by London based photographer and stylist Gavin Fernandas, the workshop will focus on styling for fashion shoots and photographing said shoots. The artist leading the workshop is an established photographer with a permanent exhibition held at the V&A which has featured in Dazed and Confused Magazine. Tips and techniques will include styling models, how to achieve the best images, directing models and setting up a shoot amongst other things. Fashion IllustrationLed by Victoria Wheeler, the workshop will focus on drawing techniques for fashion, how to draw correct proportions of the body and expressing designs in a way which suggests movement and texture. Textile Printing and Book Binding.Led by Michelle Pouncey, the workshop will focus on methods involved in textile printing and creating your own designs to print. Methods and techniques of book binding will also be explored. The event will run from 2pm – 5.30pm, and each workshop is free, however each person can only attend one as they all run at the same time. All workshops have limited numbers, so if you would like to take part, send an email to Caroline at c.alexander@preston.gov.uk to book a place or for any more questions. Unfortunately, I’m unable to make the event due to work, but if there is anyone interested who would like to attend and write a guest post for me on Sitting Pretty, please drop me an email and let me know! "I CAN FEEL THE SUN"